BEST ANSWER: For barrel cleaning, we advise against using chemicals because it can strip out the oak extract from the barrel and or damage the barrel. With proper maintenance and storage techniques, water should only be used to clean barrels. Filling the barrel with hot water and letting it sit overnight can help dissolve the tartrate deposits. For more information on barrel maintenance, please review our "Oak Barrel Care Guide" found in the MoreManuals section. Except in an emergency, we would advise against using any chemical in a barrel. Hot water and a good pressure washer or other spray method should be adequate for tartrate build up. 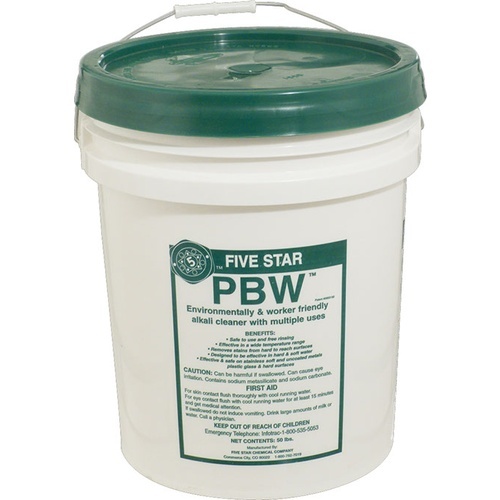 There will always be debate about making your own cleaner or using certain brands of laundry booster, but in my opinion there's no beating PBW for cleaning containers or equipment in clean-in-place systems. I've tried using "laundry booster" with my home-made keg/carboy washer but had to keep cycling the pump on and off due to excessive foaming. With water over 100 degrees F, foaming hasn't been an issue at all. It also works great when soaking labels off import .5 liter bottles and doesn't leave the residue that phosphate free TSP will. It's more expensive than some of the other options out there, but it seems to have an indefinite shelf life and buying in bulk makes a huge price difference.